I rush home from work faster than the speed of light to prepare tonight’s repast. Jim and Anton are coming for a belated birthday dinner and there’s so much to do and so little time. David has a double dilemma. He is still gripped by the lurgey and is officially mourning the loss of the premiership title, so he is able to do little else, except lie on the sofa torturing himself with action replays of last night’s events. We’re both a bit peeved that we had to miss the boys’ party on Saturday night so here’s hoping tonight makes up for it. When the birthday boyz arrive, there’s beer, bread (sourdough, of course) and dukkah while we wait for Sandra’s Champion Chicken Soup complete with kneidlach (those oh, so yummy dumplings,) to simmer to perfection. Who needs a doctor when you have chicken soup? I think it should be available on prescription! We have a bit of a breather before we serve dinner straight from the parcel, Donna Hay’s White Wine Chicken with Leeks and Green Olive Dressing with a bit of ye olde Healthy Sweet Potato and Carrot Mash on the side. It’s a while since I’ve cooked a dinner from Donna and I don’t know why – all her recipes look lush and taste terrific, and tonight is no exception! Lucky we’ve still got room for dessert, because that Tia Maria Cheesecake is my birthday piece de la resistance. It gets a sprinkling of cocoa and is then topped off with a handful of Ferrero Rocher, and if I say so myself , it looks absolutely fabulous! 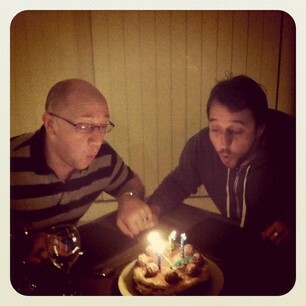 There’s just time to light up some candles and then rock da house with our tone deaf version of the birthday song. Lucky the cheesecake tastes better than our singing sounds. I don’t usually eat my cake creations, but this is one baked good, that is just too good to resist! Cheesecake heaven! I don’t know how we have any more room in our tummies but we somehow manage to find some for coffee, port and a smidgen of Chocolate Pecan Slice. And as for the rest of that cheesecake and slice, it’s going direct to doggy bag. It’s too dangerously delicious for our fridge!